What makes a good wine festival? A great selection of wine, of course, but also a great location. And what turns a good festival into a great one? Great organization to keep things running smoothly. 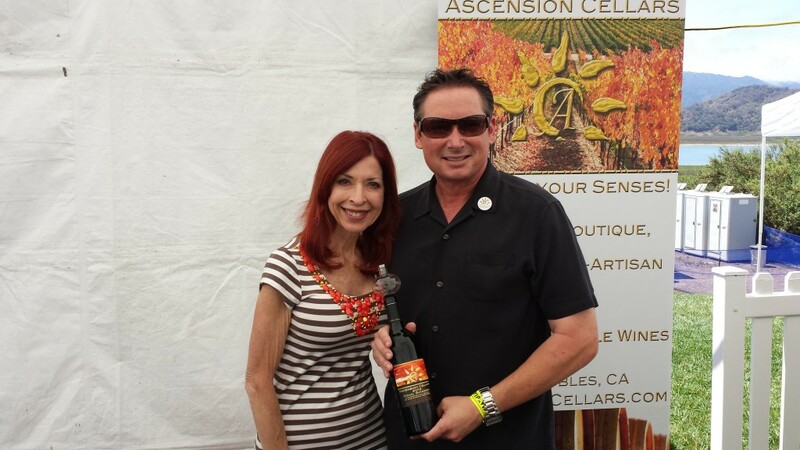 For the second day of our Southern California wine-soaked weekend, my wife Karen and I recently attended the 29th Annual Ojai Wine Festival. Now, I’m not sure how long Angela May and her team have been in charge of the event (I know it’s been at least the last three years since we’ve been attending) but they definitely have this wine festival thing down. This is a big festival, taking over much of the Lake Casitas Recreation Area in Ojai. Right on the shore of Lake Casitas, actually. Along with a wide range of central coast wineries [from Ventura to Paso Robles], the event also includes great food and beer, as well as two bands to while away a warm pre-summer afternoon. One of the things I really love about this festival is the event guide. It’s a great place for local merchants to advertise. And attendees can use it as a guide for their day as well as to follow up with wineries after the event is over. Not all festivals do this, but they all should. Speaking of something people should do, festival attendees should take advantage of VIP tickets when they are available. Many events do offer this perk for an added cost, and in most cases the extra cost is well worth it. The Ojai Wine Festival is one of those that offers a limited number of VIP Tickets, and the price is well worth it. Not only do you get early access [beat the crowds! ], but you start the festival with a glass of Barefoot Bubbly to get you in the mood. And of course, there is the VIP section of the festival, with great seating by the lake and access to the VIP wines and food, as well as beers from Stella Artois [and spirits too]. Ascension Cellars from Paso Robles was pouring in both the VIP section and the main tasting area. The wines in the VIP section were definitely VIP-worthy. All their wines were outstanding. People who know me know that I am mostly a Rhone/Zin guy, but I have to say their Soul Shaker Bordeaux blend really rocked and was my favorite wine of the day. Their Mayhem Syrah was right behind this one. Falcone Family Winery, also in the VIP section and also pouring some outstanding selections from Paso Robles along with a great Chardonnay from the Santa Maria Valley. They do something pretty gutsy with their highest end wine, producing a non-vintage 2012/2013 blend of Petite Sirah, Syrah and Cabernet Sauvignon called Annate. Knocked my socks off and came in a very close 2nd for my favorite wine of the events. Bonny Doon Vineyards from Santa Cruz continues to make tasty wines, including the latest version of Clos de Gilroy (Central Coast Grenache). Kenneth Volk Vineyards makes a wide variety of wines, some of which come from unusual grape varietals, such as the delicious Touriga Nacional from Paso Robles. Toucan Wines, based in Arroyo Grande, is known for its estate Zinfandel and Petite Sirah, which I loved. But my favorite is always Doug Timewell’s Carignane that he makes with grapes from old vines in Contra Costa County. Sadly, Doug is getting out of the wine business soon, and it will be our loss. The Ventura County Winery Association had their own little corner of the festival. Pouring were Cantara Cellars, Panaro Brothers Winery, Plan B Wine Cellars, Magnavino Cellars and Sunland Vintage Winery. Lots of good wines; standouts for me were the Zinfandel and Cabernet Franc from Cantara and the Grenache Rose and the Syrah from Plan B. As I wrap up, I need to add one more element to a great festival – the attendees. The crowd is about as friendly as it gets and we have made friends there who we look forward to seeing annually, maybe sooner. So, that’s it. Great wine, beer, food, entertainment and people all on the shores of Lake Casitas. Not sure it could get any better.